We have a big old ceiling fan in our bedroom... and I mean that literally. It's large and ancient. Our bedroom was part of an addition to our house in the '70s, and for some reason, the owner decided not to add the heating and air conditioning duct work to it. This doesn't surprise me because based on a few other "shortcuts" I've found, I'm pretty sure it was the owner himself and a bunch of his friends who put the addition on the house. Anyway, because the bedroom has no forced air, they compensated by adding an electric baseboard heater for when it's cold and a ceiling fan for when it's hot. 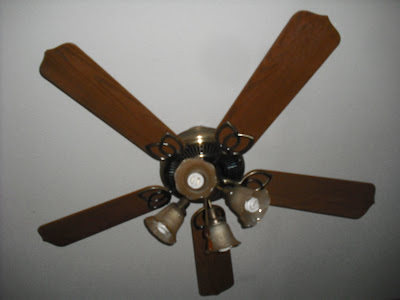 Unfortunately, like most things that get old over time, this fan has developed a few problems of its own. For instance, when I put it on low, it "ticks" a "tick tick tick tick" in perfect time, exactly as if I had a metronome clicking over my bed. And for a musician, that's a major problem. Imagine trying to fall asleep, but all you can hear is 20 different songs that fall into the same time as the beat your fan is tapping out. It's the exact same reason we don't have any analog clocks in our house. Do you have any idea how many songs are written to 60 bpm? I know, it's insane! But that's not the fan's worst problem. If you put it on high, it wobbles and swings back and forth violently and makes a horrible "thump thump thump" sound like an injured helicopter trying to take flight. It's really rather frightening. In fact, we have actual concerns that if we leave it on high, it will break itself loose from the ceiling and decapitate us in our sleep, leaving two severed heads on our pillows for our kids to find in the morning. So the other night, right as I was drifting off to sleep, Charli decides she's too hot and can't sleep. This of course translates to, "honey... will you turn on the fan?" Knowing full well that the low speed wasn't going to cut it, I went straight for the high setting and jumped back into bed. "NO!" Charli screams at the top of her lungs. "THAT'S TOO FAST!" "Shhh... quiet!" I whispered. "The kids are right outside the door in the living room." "STOP IT... IT'S GOING TOO FAST! IF THAT THING HITS ME IN THE HEAD IT'S GOING TO KILL ME!" "Ok ok... stop yelling! I'll turn it down." But I'm pretty sure I was too late, because as soon as I turned the fan down I noticed that the TV volume in the other room had been turned up 10-fold, as if to hide unwanted noises coming from a certain parents' bedroom. Of course I could have just been paranoid, but I still didn't have the guts to stick my head out the door and ask them to turn it down. Too funny!!! Can't wait to read the comments you're going to get!!! That was awesome. The code in our house is, "Turn up your radio." Bwahahahahaha!!! That made me laugh so hard I was wiping away tears. I laughed out loud. But hey, maybe they'll show a little more respect now, hm? I can't stand ticking either, and the Blades of Death photo is EXACTLY why I didn't install a ceiling fan in our bedroom (even tho we need one). So I'm just wondering: is it common in your household for Charli to scream about "that thing" hitting her in the head? I'm picturing the kids kind of rolling their eyes and turning up the TV. Lol that's great!!!! When my kids were little when we wanted to get dirty we'd tell the kids we were going to fight crime in our bedroom to explain the noise and told them it was dangerous so they had to stay as far away as possible hahahaha. 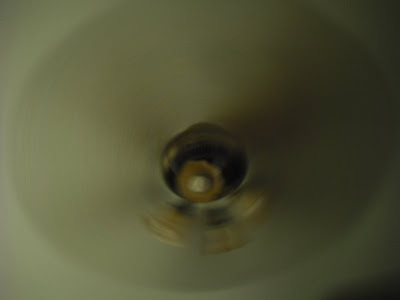 rick - I agree... a wobbly out of balance fan IS disgusting! mom - Better cover your eyes mom. I have a feeling people are going to start providing TMI. gette - That's pretty impressive... that you have a code. mooselet - Thanks. It seems a lot funnier to me now. Theresa B - Are you kidding? I have 3 teenagers. I won't see respect for at least another decade. JD - You bet. Doesn't even faze them anymore. badasssushi - Ooh... imagine the possibilities! Who gets to wear the cape? My wife and I call it folding socks. Teri - I suppose that's better than bursting out into laughter in a room full of co-workers. Depending on what position you sleep in, it's really not your head that the fan will take off if it flies free. It's ... .er ... um ... other things. Please, for so many reasons, don't turn that fan on high again! Your " QUESTION " --- --- --- "Do you have any idea how many songs are written to 60 bpm? YES YES YES I KNOW WHY !!!!!!! The difference between a fan and a fan dancer is that one is better on, and the other is better off. You should have stumbled from the room, looking completely disheveled and spent walked to the kitchen and fixed a large glass of water--downed it and as you stumbled back to the bedroom told the kids--"turn that damn tv down. We're trying to sleep in there!" Oh I love it, I love it! Your poor kids. We have issues with our -- far newer -- fan, although I fixed the main one. Our fan doesn't go past medium, but fortunately we at least have a/c in our room :) Have your children spoken to you since? OMG my word was caroused! How perfect! kathy - Sorry, I sleep on my stomach... but nice try! dream master - Wow, thanks ... I really didn't expect to actually learn something on this post. bill - I'll get back to you my response... as soon as I figure out what you're talking about. ed - Could I at least put my pajamas back on first? michelle - Sure, my kids speak to me all the time... "Dad, I need some money. Dad, I need a ride. Dad, I need..."
Your mother said that none of her boys would know what a fan dancer was! Which is why I will never own a ceiling fan... I have always imagined those things flying off out of control. Hahaha...oh this brings back memories of me being a teenager and living at home. Bad memories. An answer to your question; 765,982 songs are written/sung to 60 BPM. Hahahaha! I laughed so hard I choked! And JD's comment - **is it common in your household for Charli to scream about "that thing" hitting her in the head? ** Hahahaha! I agree you should keep that thing away from her head. You might think about replacing that fan, though. Our living room ceiling fan in our last house DID fall out of the ceiling while the girls were right under it. It only fell a couple of feet and was hanging by wires, but it was a significant emotional event. That is very funny and made my morning. I am just happy that my daughter's bedroom is down the hall and we have A/C. I'm less concerned about your reputation among the kiddies and more that you can't blog without a head.